Around 106,000 Americans had gastric sleeve surgery in 2015 — significantly more than the previous year. Experts recommend exercise after a major weight-loss procedure in order to strengthen the heart and bones, build muscle, reduce stress, improve mood and burn calories. Walking is a great idea after gastric sleeve surgery, and the latest technology makes it easy to track this type of exercise. If you have recently undergone a gastric sleeve operation, Google Fit lets you monitor your walking goals and weight loss progress directly from your smartphone. A gastric sleeve operation is a procedure where surgeons reduce the size of your stomach by around 15 percent of its original size. This surgery limits the amount of food you can consume, so you should feel fuller after eating small meals. 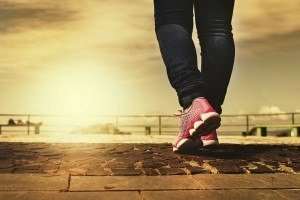 Why is Walking Important After Gastric Sleeve Surgery? Walking improves your blood flow and expedites wound healing after surgery. Lack of exercise after a major operation could put you at a higher risk of developing a blood clot and conditions like pneumonia. Walking also helps you burn calories. A 180-pound person burns, on average, 100 calories for every mile they walk, while a 120-pound person burns 65 calories per mile. Google Fit is a mobile app that uses the built-in sensors on your smartphone to detect walking steps. This platform tracks more than 120 activities, from slow walking to brisk jogging. Download Google Fit from the Google Play Store on your Android device. You can then customize your exercise goals from the Daily Goals tab in the Settings menu. Google Fit will track the number of steps you take every time you hold your phone. Want to track your progress over time? Head over to the See Graph Details tab for an overview of your walking steps from the previous days, weeks and months. You can also connect third-party exercise apps — RunKeeper, Strava, Runtastic, etc. — with Google Fit. Google Fit monitors your fitness goals after gastric sleeve surgery. The result? You can improve recovery times and boost your overall health. If your focus is long-term weight loss, bariatric surgery is a proven way to accomplish this goal. But just as with anything worth having, you have worked hard and follow the guidelines provided by your physician in order to lose the weight and keep it off. Avoiding these common mistakes is a great way to ensure you finally reach your goal weight and stay there. Your physician will recommend vitamins to help your body recover from the surgery and maintain the best health possible. Don’t try to save money by purchasing over-the-counter vitamins. Take the ones recommended by your doctor to ensure your body is getting all the vitamins and minerals it needs. Surgery is serious business, and it is important that your body heals properly. Now that your caloric content is constructed, it’s vital that you pack your diet with healthy nutrients. Your body won’t function well if you use your calorie rations to only eat potato chips or other foods that have no nutritional value. If you don’t eat the foods your physician recommends, you are at risk of developing medical problems, such as heart disease, memory loss, fatigue, etc. Stomach and gastrointestinal problems are also a concern. Drinking plenty of water or healthy liquids is one of the most important things anyone can do to enjoy maximum health. Water helps every part of your body function well. Staying hydrated is particularly important for surgical patients since it helps the body heal provides energy and hastens weight loss. If you don’t like tap water, buy flavored water, add lemon to your water or drink another healthy beverage, such as unsweetened ice tea. You may think that a tiny handful of nuts, chips, crackers or candy won’t affect your diet, but these foods pack a lot of calories in small portions. If you don’t count the calories of every morsel, you may wind up consuming hundreds more calories each day. This common mistake is one of the ways bariatric patients fail to reach their long-term weight goals. Almost everyone enjoys an alcoholic beverage at times, especially if there is a special occasion. Be cognizant of the fact that alcoholic beverages are full of calories and can quickly cause you to go over your calorie limit. Carbonated beverages are quite refreshing but shouldn’t be your beverage of choice when you’re thirsty. They are full of sugar, which substantially increases your calorie intake. Carbonated drinks can also cause gas pain. At times, more serious issues can be mistaken for gas pains, and this can cause you to neglect medical care when you really need it. Having bariatric surgery is your chance for a new life filled with the quality living you crave. Following the guidelines the doctor gave you ensures you stay focused on this long-term goal and eventually reap the rewards! Are you suffering from type 2 diabetes? New research says that weight loss surgeries might just be the solution. One study, published in the New England Journal of Medicine, found that slightly obese people had a better chance of reversing diabetes if they underwent weight loss surgery. And, it was even shown that the life quality of those patients had improved significantly. In the study mentioned above, patients underwent bariatric surgery. Five years later, one-third of those patients experienced a complete remission of their illness. Those who only sought help through counseling, therapy and other forms of medication did not fare so well in comparison. The weight loss surgery enabled patients to have healthier levels of blood sugar, and they also needed less insulin on a day to day basis. Their BMI was lowered, due to the weight loss, resulting in lower cholesterol and improved quality of life. Type 2 diabetes causes extremely high blood sugar levels, so this was one of the most noticeable changes after surgery. Another Swedish study showed similar results in patients who had weight loss surgery. In the research, 72 percent of patients achieved remission in just two years following the surgery. Another study followed the history of 2,010 obese patients, 343 of whom suffered from type 2 diabetes. From 1987-2001, many of these patients underwent a number of weight loss surgeries. Besides the impressive weight loss and lower cholesterol levels reported, they experienced a significant deterioration of beta cells (which often cause spikes in blood sugar). 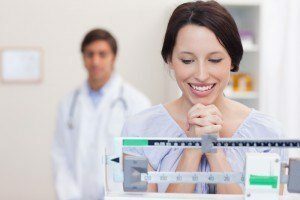 Although researchers still need to further investigate how weight loss surgery can lead to remission, it is reassuring to see that surgery can be one solution for type 2 diabetes patients. A diabetes epidemic is currently plaguing the country, which means actively seeking help for weight control, even before diabetes is diagnosed, is essential. If you would like to get a personal consultation for your case, call or schedule an appointment with one of our physicians today. We’re glad to help answer any questions you may have regarding surgery and weight loss. The items below are the minimum necessary for approval of your weight loss surgery. (This is BCBS policy, which is what most insurance companies follow). However, Medicare is straight forward in their process. They only go by the BMI specifications listed below. BMI 35 or greater with co-morbid conditions, including but not limited to HTN on optimal drug therapy, cardiovascular disease, diabetes (must be treated with insulin or oral agents), pulmonary hypertension or severe obstructive sleep apnea (RDI of 50 or greater). Documentation of participation in a physician-supervised program of nutrition and increased activity including dietitian consultation, low-calorie diet, increased physical activity and behavioral modification. The program must be for six consecutive months and must be within previous 12 months of the request for surgery. Documentation of program participation must appear in the medical record by the attending physician. Records must include comments by the physician regarding patient progress or lack of progress OR acceptable with medical record documentation of medical supervision are; Weight Watchers, LA Weight Loss, Jenny Craig, EatRight etc. Not acceptable are self-directed programs such as joining a gym, Atkins diet, calorie counting, low fat, cutting back, internet programs, etc. Active participation and documentation of non-surgical methods of weight loss. Diagnosed as morbidly obese for 3 years or more in medical records. A letter from the PCP and dated photographs will be considered in lieu of recorded heights and weights. Consult and Recommendation for a surgeon from a bariatric surgeon. Must stop smoking at least 8 weeks prior to surgery. Some insurance companies vary on criteria. Some only have a 3-month diet, some have no diet, and some have a 6-month diet. The main thing is the BMI requirements…35 with a comorbidity and 40 without. Now with Private Pay is different. The Comorbidities do not have to be present.